Unless you’ve been living under a rock, chances are that you’re well aware of the design phenomenon that is the Italian fashion house Armani. Having long established themselves as a household name, this brand is well known for its wide range of trendy products, not least of which are their designer watches. Armani watches are made to suit a variety of purposes— you can don these for special occasions, with everyday corporate wear, and even for outdoor adventures. All these watches have one element in common— they are all designed to complement and enhance your personal style. Let’s take a look at some of the most popular Armani watches on Ethos, their features, and how they can increase your style quotient. 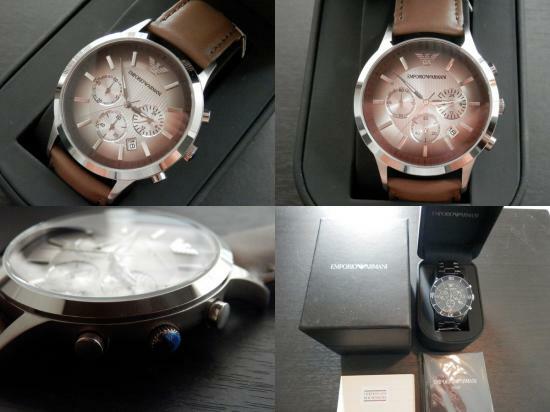 Emporio Armani’s Meccanico range exemplifies beautiful design. Described by the brand as a “seamless blend of mechanical innovation and timeless style,” this line of watches is one that blends technical finesse with great functionality. The watch, as its name suggests, features a self-winding mechanism— this means that the movement of your hands is what drives the watch. Such engineering brilliance isn’t all there is to this watch though; the watch also scores on aesthetics. 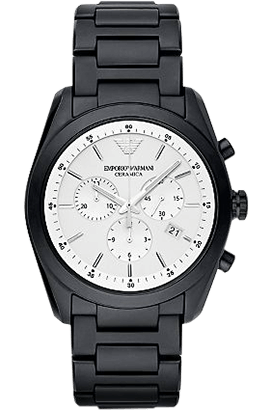 Being an Italian brand, looks are expected, and Armani delivers on this front— the back of the watch is tastefully open to view, and this gives the watch great visual appeal. 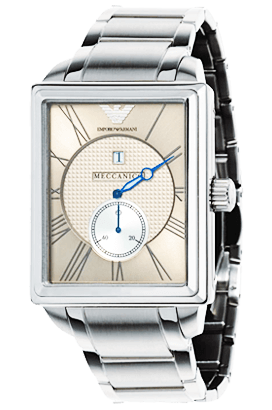 The watch has a rectangular Art Deco dial with stainless steel casing, a stainless steel strap, and a beige textured dial. It is an indispensable accessory for the man that has an impeccable style and a taste for the classics. This design is a must-have for any refined wardrobe. Whether you’re looking to accentuate your clean-cut corporate look or to dress casually for a party, this is the watch you need— it has a cutting edge design that is sure to appeal to all horology enthusiasts. The watch features the simple round stainless steel dial and a stainless steel metallic strap. But the details that went into construction of the watch are what makes it so special— it has a navy blue face that gives it great aesthetic appeal, and the stainless steel strap actually contains elements of both polished steel and brushed steel. Beyond its outward appearance, the watch also has some great functions. Along with the expected three sub-dials, the watch also has a date window. Given these features and its all-around looks, this watch is the ideal choice if you’re looking for a timepiece for all occasions. 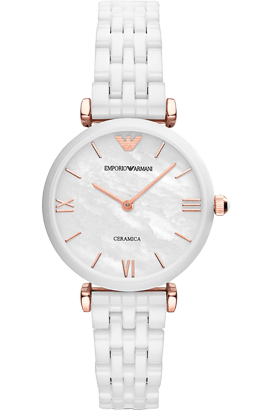 Being one of the world’s top manufacturers of fashionable clothes and accessories, Emporio Armani delivers the goods in their imitable style with this model from their Ceramica range. This watch showcases the manufacturer’s penchant for impressive design, combining elegance with pragmatic features. This design approach is showcased by its colour scheme, as the rose gold accents only highlight the stark beauty of the watch – classy, and by no means flashy. The round casing houses a stylish white face with rose gold hands and details. The rose gold crown is a graceful touch. This is a relatively recent addition to the Italian manufacturer’s impressive collection of watches for women. This watch epitomises the beauty and appeal of rose gold, and this colour is prevalent throughout its parts, covering both the casing and the metal strap. Feminine and elegant, the design is one of the best examples of Armani’s work. 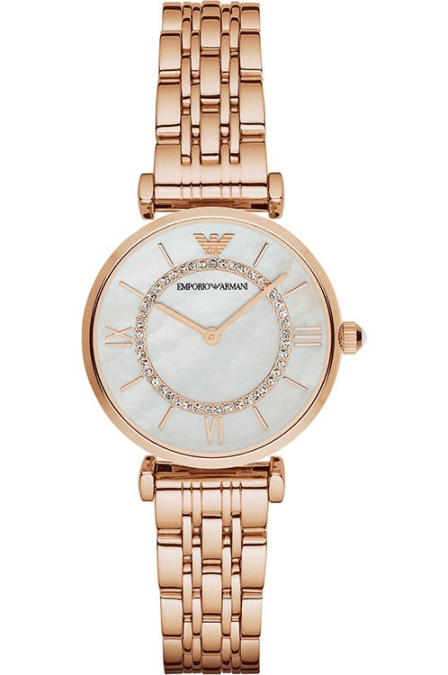 The glossy mother of pearl dial is sure to turn heads, and it perfectly complements the aesthete of the watch. 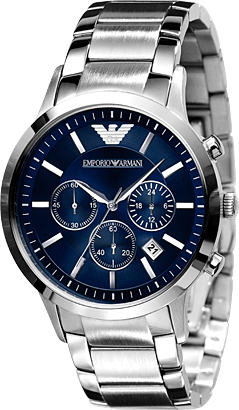 You can couple this timepiece with formal as well as casual clothing to add a dash of metallic polish to any ensemble. Even with the high standards set by the Ceramica range, this watch brings a unique element to the table. This monochrome stunner is suitable for both formal as well as casual occasions. It features a stark white chronograph face that contrasts beautifully with the matte black metallic strap. Additionally, the watch is also water resistant for up to 50 metres.